It has become clear to me within the last year that I had let go of a part of myself over the last few years, especially during college. I am no longer the little girl who used to draw pictures on construction paper for the stories she wrote, which she had her father write along the bottoms and margins of the paper. The preteen who filled up her study hall period with writing and not homework. Who used to run in the forest after school, day dreaming and talking with her characters, designing stories and weaving them together in a blanket of notebooks while she would sit up late at night, scribbling. The young woman who set her eyes on the arts high school in Minneapolis, found a way to get there and grew so much in the care of loving teachers and with a class of incredible young writers. Who stood up on stages, took a deep breath and read her words aloud with pride and lived in the rush of sharing her art. I was placing high in national contests. I was making (not much but some) money for my writing. There was a path before me. I allowed this part of me to slip to the wayside out of necessity. Part of letting this part of myself go was a matter of growing up and exploring new parts of myself and the world. It was clear that studying creative writing or English in college was not going to fulfill me and I have no regrets about my college experience in global studies and social justice. If anything, it has made me more well-rounded as a person, and therefore a better, more well-rounded writer. Plus it opened up actual career possibilities for me (sorry English majors), and brought me to the place I am today. More than anything, that novel (I've been playing with the working title Dear Bird), for which I received enough money in an national competition to go to Northern Ireland and do research in 2009, has fallen by the wayside. While taking 15 to 18 credits a semester, I worked at least 20 hours a week, sometimes up to 50 or 55 when I was a truly crazy person. Between coming home late and just wanting ice cream, a glass of wine and to curl up into bed but looking down at a bed covered in notebooks again, homework this time, I have to admit that there was not humanly possible way I was going to keep working on that book. I wasn't going to be reading about the IRA, the history of Irish politics or writing in my character's voices to get to know them better. I try to say all of this without shame. I was once told (albeit I was told this by an unhappy man who was about to break my heart) that "you can't call yourself a writer if you don't write." I have always looked at myself as a writer, as an artist. I have always seen myself as a collector of stories, my own and others', and I get to know people and the world around me through stories. I know that I can call myself a writer during times in my life when I'm not staying up late to finish writing the newest chapter of my book. I have plenty of writing friends who need to write daily for sanity. I have other friends who, like me, need the breaks from the notebook to feel sanity. Right now I'm working on reweaving that discipline I had when I was a little girl into my life. Now that I have more time on my hands than during undergrad, I don't have mounds on homework to do after work and I only work about 40 hours a week, I could actually write. I could re-read that shelf full of books about the IRA. I could stay up late working and working, flickering the light on and off because each time I put my head down the next few sentences emerge and I know I will not remember them unless I catch them at the moment. I have lost some of the steam that 14 year old had. Maybe it's the lapse of time between then and now. I have to chip away at the grimy walls of this habit. I wonder if I was more attached to that first novel, Catching Dragonflies, than this one. It was more fun to write. This book has more intricacy and character development. It's more about the characters than the plot. I have spent time talking to some of my old writing professors over the last few months and I realized sometime this summer that the time in my life to choose writing has come. Talking to dear William Reichard of HECUA about his residencies and grants throughout the year, I realized that there are ways for me to make space for writing in my life. I have to choose to do it once again. I have made some friends who are professionally writers here in California. They have given me pushes and reminders of what I want. It's all about finding a balance between my art and the other things I want to do with my life - which are many. Good news is I can meld them. The long and the short of it is that I've been spending the last few weeks applying for grants for money to go back to Northern Ireland, residencies to get the work for the book done and generally scheming to make my way to Europe again next spring (2013) in order to do the research necessary for the novel, then to set aside the time needed to do the writing. This project is still percolating, which feels a little like an excuse, but its simmering and will turn into something beautiful if I put the work in. First step is getting some funding, which means grants, applications, grants and more grants. 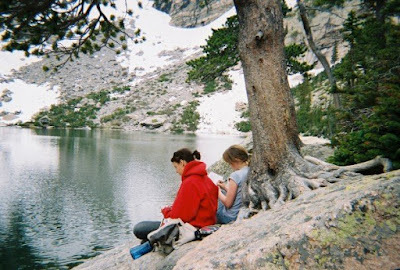 My friend Deb and I in Rocky Mountain National Park, June 2007, just after we graduated from Perpich Center for Arts Education in the literary arts class.